The Zamboni Liberation Theory(2009) still holds the world enthralled with the promise of miracle relief for people suffering the symptoms of multiple sclerosis. Daily, we hear exciting reports of astounding results to the “Liberation Procedure.” While the science community and the MS Society hesitated to approve this procedure without more research, newspaper editorials and politicians, encouraged wide scale accessibility to the “Liberation” treatment and tell us that people with MS should be allowed to hope. In the conclusion to his research paper, Dr Zamboni states that clinically defined Multiple Sclerosis (CDMS) is strongly associated with chronic cerebrospinal venous insufficiency (CCSVI). This scenario, which he claims has not been previously described, is caused by narrowed and blocked veins in the neck. In fact, Dr Zamboni has taken the liberty of renaming cranio-vertebral-venous system CVS research that dates back to the 1800s! With the worldwide response to Zamboni’s theory, and huge expectations, if anyone in the research or health care systems had done a literature review, many costly trips and disappointments could have been avoided. While Zamboni writes that multiple venous strictures of unknown origin cause MS, descriptions of causes of these strictures have been published for more than a hundred years. When the “Liberation” theory was published, I happened to be reading a book (1982) by Swedish neurologist Patrick Stortebecker, describing the history of research in the Cranio-Vertebral Venous system CVS, with 241 references to other studies. He describes work published in 1884 by neurologist Pierre Marie dealing with concerns about society’s serious dental problems, and the resulting symptoms of neurological diseases, including sclerose en plaques, the French term for MS.
Stortebecker engages in a detailed discussion of studies by German researchers, Driak, Aiginger, Bottan and Neumayer, and chides the medical system for ignoring research proving the role of oral and dental infections in the symptoms of nervous disorders, including multiple sclerosis. In his 1961 paper, Stortebecker observed that the vertebral veins were described more than 400 years ago, and known since the time of the Italian Gabriel Fallopio (1523-1562) and Thomas Willis (1664). Stortebecker refers to a clinical study of 140 MS patients with a history of optic neuritis: 88% showed signs of decayed and infected teeth. In my experience as a patient, I have fired, or been fired by, more than one doctor for insisting at times, that symptoms dismissed as “just your ms” were in fact, the result of untreated inner ear, or sinus infections. So I am sensitive to the haste to link every neurological symptom to multiple sclerosis. In 1985, my daughter experienced “funny” symptoms, and a tour of referrals ended in the office of a neurologist who did not hesitate to diagnose MS. However, after extraction of her wisdom teeth, one of which had been infected, there were no further problems. The dentist explained that every time she chewed, inflammation and toxins were released into her body causing the symptoms. So while a huge body of research supports the theory that blockages in the cranial cerebral venous system can cause neurological symptoms, more work is needed to prove whether or not this causes multiple sclerosis. That the Liberation treatment might give relief is an exciting solution, but is it really the cure? Dr Zamboni adds that only longitudinal clinical and MRI observation in time and space is capable of establishing the possible conversion of clinically isolated syndrome (CIS), meaning a questionable symptom, into a case of clinically defined MS.
Perhaps the old name “diffuse, disseminated sclerosis,” has more meaning than multiple sclerosis? Dr Zamboni has declared, strictures in the cranio-venous system (CVS) to be chronic (an illness or problem persisting for a long time), and coined the phrase chronic cerebrospinal venous insufficiency (CCSVI). Peptide researcher Candace Pert has commented on the confusion caused by changing terminology, and says that medical researchers would rather use each other’s toothbrushes than each other’s scientific terms. By pointing us in a different direction, Dr Zamboni has done us all a favour. People with MS have awakened to their power to change the way things are done. Bravo! Hopefully, more people in the Health Care system will re-search the research we already have, for simple new treatments. Hopefully, we finally recognize and admit, the importance to Dental Care to general Health, and give it priority over drug coverage. But it’s a slow process. MY hope is, that clinicians will look seriously at the research we already have on possible causes of the strictures – dental problems, and sinus, tonsil, throat and lymph infections, and take more time, as suggested by Rodriguez of the Mayo Clinic, and Zamboni, to attach the label multiple sclerosis to neurological symptoms. MY hope is, that Health Care professionals will consult past research for new information. Many authors have proven to be ahead of their time. I know it’s called re-search, but let’s stop going in circles. There are many miracles in research – not always where we expect to find them. This article reports that Dr Zamboni told a recent MS conference in Gothenburg, Sweden, that surgery is not recommended at this stage, that patients shouldn’t go ahead with such surgery except in the case of clinical trials. Even though the vein widening procedure was never approved in Canada hundreds of Canadians with MS mortgaged their homes and travelled to other countries, paying thousands of dollars to have their veins widened through a venoplasty procedure. Some patients even had permanent stents put in. Canada invested millions on a series of research programs to test the theory after patient groups protested on Parliament Hill. But one by one the studies revealed – there was no relationship between blocked veins and MS.Indeed, will that be the end as Traboulsee suggests? Hundreds of web sites claim the Intervention procedure is a lifesaver. 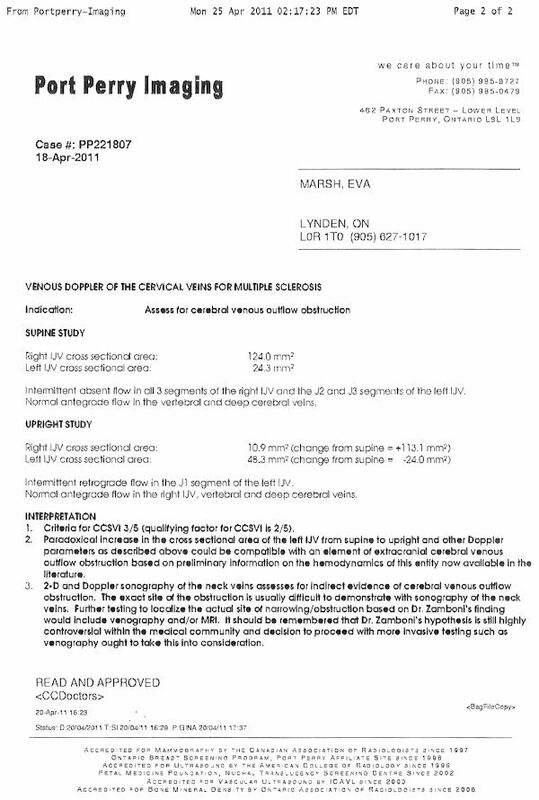 In 2011, I was invited to participate in a study of non-invasive methods of clearing the strictures in the neck ad temples, the cranial vertebral venous system CVS. Although I have reservations about Dr Zamboni’s theory, I was curious and agreed to at least do the Doppler test. My family doctor received the results and was concerned about my reaction. She was relieved after I told her that I had been symptom free since 1991, and had no intention of proceeding with further testing. I declined the “Liberation Procedure” and was dropped from the study. In Yoga I had learned how deep breathing can cause enough pressure to constrict veins and clear blockages, so I have reservations about the Doppler test. Please feel free to share your comments, and let me know if you are an MS patient, whether or not you have had the Procedure, a health care professional, or a concerned individual. Thank you. Zamboni P, R Galeotti, E Menegatti, AM Malagoni, G Tacconi G, S Dall’Ara, I Bartolomei and F Salvi. (2009) Chronic cerebrospinal venous insufficiency in patients with Multiple Sclerosis. J Neurol Neurosurg Psychiatry April 80(4): 362-99. Zamboni P, E Menegatti, I Bartolomei, R Galleotti R, AM Malagoni, G Tacconi G, F Salvi (2007) Intracranial Venous Haemodynamics in Multiple Sclerosis. Curr Neurovasc Res Nov 4(4): 252-08. Acta Psych Neurol Scand sup 157, 36:3-62. Ibid (1982) Dental Caries as a cause of Nervous Disorders: Epilepsy – Schizophrenia – Multiple Sclerosis – Brain Cancer. Stortebecker Foundation for Research. Stockholm, Sweden. P116. Sadovnick AD, Yee IM, Attwell-Pope K, Keyes G, Kipp L, Traboulsee AL (2017) Patient-Reported Benefits of Extracranial Venous Therapy: British Columbia CCSVI Registry. Can J Neurol Sci. 8:1-9. If there is any aspect of your experience with the diagnosis of ms that you wish to share, it will help expand my viewpoint.